What is a MIAMS ? When it comes to financial arrangements after a divorce there are many things that you will have to consider. You will have to think about what you are going to do with the family home, for example. You may decide to sell the home and split the proceeds or allow one person to buy out the share in the home. There will also be decisions to be made concerning shares and other financial assets, such as pensions. This will have implications both now and in the future so you need to also consider how financial circumstances may change. For example, if the value of your shares was to depreciate. Mediation enables you to consider all of your financial arrangements and to sort out what should happen in a mutually agreed fashion. Whatever the complexities, and entanglements, in terms of your financial arrangements mediation is a comprehensive solution. Court proceedings can be very distracting. They take a long time to resolve and can be very stressful. In contrast, mediation is a relatively quick process which allows you to solve issues relating to your divorce in an efficient way. Our mediators are experienced in including children as part of the mediation process. We can explain to children what mediation involves and make sure that the mediation meets their needs. Grandparents can be involved in the process of mediation. In legal proceedings, mediators are often left out of the agreements that are made. Mediation can take their interests into account. 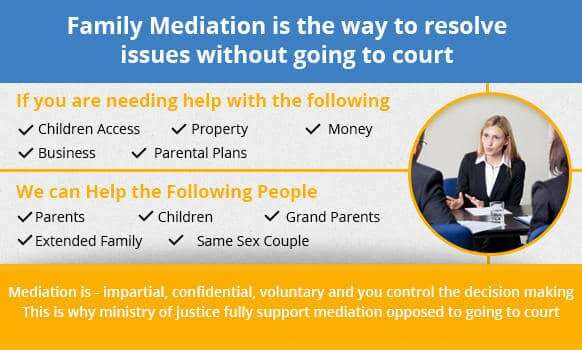 Because our mediators are very well trained, they are able to deal with various, complex, family circumstances. Indeed, mediation is renowned for its flexibility. Miams Family Mediation is an incredibly successful tool which helps many people each year deal with an uncomfortable situation. As well as being impartial, the mediator will have the best interests of both parties at heart and consider everyone\'s point of view. 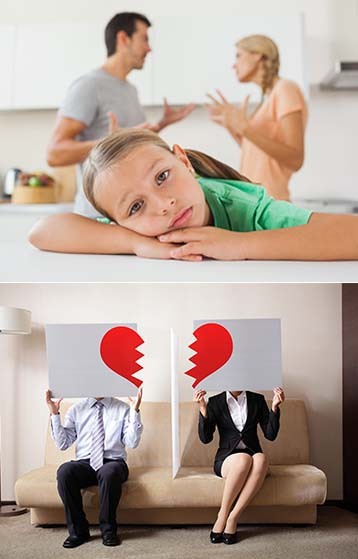 Family's are deeply affected by divorce or separation, especially when there are children in the family. Often these painful situations can be helped with the aid of a mediator who will hold a Mediation Intake Assessment Meeting or MIAM. MIAMs can soothe ruffled feelings and ensure that communal assets are divided equally, make sure that financial obligations of both parents are laid out and help to make the break as easy as possible for all the members of the family. When attending a court proceeding on the matter, the family will need to present an FM1 (Family Mediation 1 form) which confirms that a MIAM has been held. It is important to trust the process at a time when feelings may be hurt and trust has been broken. Mediation does work, but the process must be given time, and compromises will probably have to be made on both sides. It is often hard to think of the big picture at a time when emotions are running high, with any backing down seen as 'giving in' or being weak: this is where mediation can form a buffer between the parties. Click here to watch video on Family Mediation. 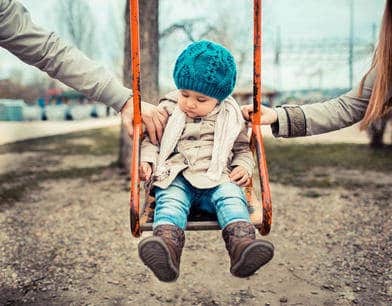 As of April 2014, significant changes were made to the judicial system regarding separation and divorces, particularly where children were involved. These changes ensure that the welfare of the children is paramount, with minimal impact on the children and as little negativity as possible. One of the major changes was a requirement for a mediation session or MIAM to be attended before any court proceedings to do with financial or custody matters (hence the need for a FM1 to be produced). If the split is acrimonious and both parties find it difficult to be in the same room, as would happen with face to face mediation, it is possible to ask for shuttle mediation. Shuttle mediation happens when the two parties are seated in separate rooms and the mediator shuttles between the two, discussing issues and offering solutions. Shuttle mediation is often a good solution with distance between the parties allowing for rational and reasoned thinking. Mediation sessions are now a legal requirement, and your ex's lawyer will make this clear to him or her. Offering shuttle mediation, in which they will not have to share a room while coming to an agreement, is sometimes a way to make the thought of mediation more palatable. Mediators can also help with will disputes: resolving issues between heirs and coming to an acceptable compromise in the event that the will is ambiguous or unclearly worded.